The Stress Engineering Services Measurement and Controls Division has designed several new products for collecting data in the field and in the lab. 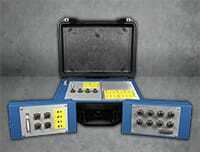 Two of the new systems are based on the National Instruments SCXI hardware platform. This platform has been frequently used by our engineers, technicians, and our clients so adapting this platform to the always-changing computer technology is a good choice for the near future. The SES-1202 (USB Interface) – The main benefit of this unit is that it is a highly field-ready system. This system also uses a USB interface for connection to a laptop or PC of the client’s choice. We have recently been developing another set of products, MobileDAQ, for a smaller channel-count market. The small size and portability of the product makes it an ideal choice to take to the field. The systems are available in a single cell unit or a larger four cell unit. The four cell unit is provided in a table top box or a Pelican case enclosure that can include a PC, monitor and keyboard/mouse.